There’s an old Kingston Trio song that goes “you can see by my outfit that I am a cowboy; get yourself an outfit and be a cowboy too…” I frequently think about this song because the roles and/or identities we take on are so often visible in how we present ourselves. When I was in graduate school training to become a therapist, my sister students and I went to our national professional convention. My friend Robin commented that she could see how therapists dress: flowing, comfortable, made of natural fabrics. Of course our earliest conditioning is in our families. Recently I attended a committee hearing on a bill about federally-owned land in Nevada which would greatly impact ranchers. As I approached our state legislature building I saw a family exiting: two parents and three elementary-aged school children, all dressed in jeans, western shirts, boots, and cowboy hats. At the same time, going in was a group of lobbyists, all dressed in dark suits, including a boy wearing a dark suit and tie too. We teach our kids who we are by dressing them like we dress ourselves. 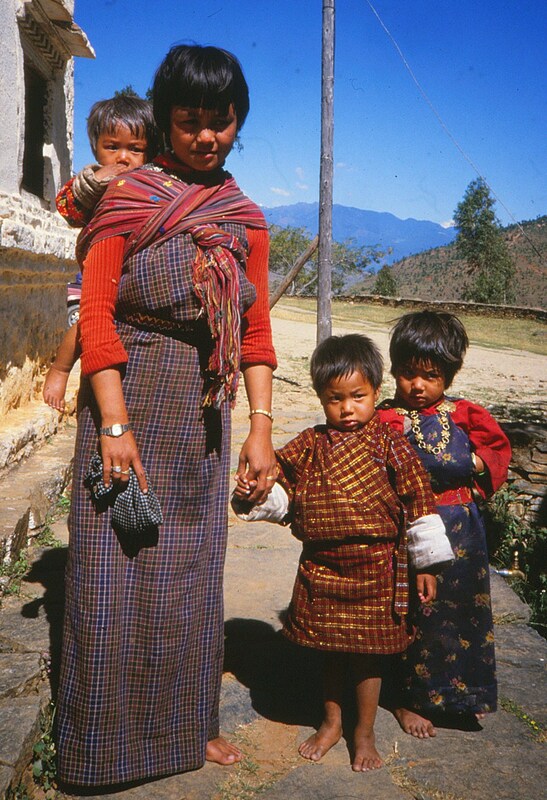 This Bhutanese family is dressed in their best traditional clothing. In Bhutan there has been a law requiring all Bhutanese to wear traditional dress in order to preserve Bhutanese culture. This has led to discrimination against other ethnic groups who live there. Sometimes in our urge to protect our identities we can also do harm. This entry was posted in Uncategorized and tagged Identity. Bookmark the permalink. What a contrast we have with all the different dressing..it makes life interesting whether it is cultural or within the same culture in the same town. Thanks for sharing..